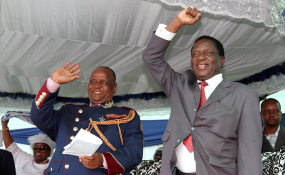 President Emmerson Mnangagwa (right) and Bishop Nehemiah Mutendi, left (file photo). "We need some leaders of the churches to be in Parliament and we wish the voice of the church to be heard," said Bishop Mukonowengwe. "We also need land to build churches as some of our land was taken during the land reform programme." "I am not sure that it's a place for Church people, you need to have the thick skin of an elephant to absorb what happens in Parliament," said Mnangagwa. "But we in government agree with you, you have a role to play in society, the role of inculcating strong molarity among our people." He added, "Is it true that when we begin Cabinet we hardly pray, we just being work but in Parliament we pray before we begin business." "But I think the concept of Minister of Religion is broader than mere praying." "You have requested for the restoration for the National Day of Prayer, you should have done it yesterday," said the President. "Let me assure you that freedom of religion is guaranteed in our Constitution and my administration shall continue to uphold the provisions of our Constitution."